Josie Rourke marks her directorial debut with this drama. Mary Queen of Scots––with Saoirse Ronan in the title role and Margot Robbie as Elizabeth I––has begun filming on location in England and Scotland. The Working Title film marks the directorial debut of Josie Rourke, the artistic director of The Donmar Warehouse. Beau Willimon––who was nominated for an Academy Award for The Ides of March and an Emmy Award for House of Cards––adapted John Guy’s acclaimed biography My Heart is My Own: The Life of Mary Queen of Scots for the film. Saoirse Ronan earned her first Academy Award nomination for Focus and Working Title’s Atonement, and was again an Academy Award nominee for Brooklyn; she also starred for Focus as the title character in Hanna. Margot Robbie, a BAFTA Award nominee, has starred in such blockbuster hit movies as The Wolf of Wall Street, The Legend of Tarzan, and Suicide Squad, for which she won a Critics’ Choice Award. Joining the cast are Jack Lowden (Dunkirk, England is Mine), Joe Alwyn (The Sense of an Ending, Billy Lynn’s Long Halftime Walk), Martin Compston (Sweet Sixteen, Line of Duty) and Brendan Coyle (Downton Abbey, Me Before You). Also featuring in the cast are David Tennant (Doctor Who, Broadchurch) and Guy Pearce (Memento, LA Confidential, The Adventures of Priscilla, Queen of the Desert). Mary Queen of Scots explores the turbulent life of the charismatic Mary Stuart. Queen of France at 16 and widowed at 18, Mary defies pressure to remarry. Instead, she returns to her native Scotland to reclaim her rightful throne. But Scotland and England fall under the rule of the compelling Elizabeth 1. Each young Queen beholds her “sister” in fear and fascination. Rivals in power and in love, and female regents in a masculine world, the two must decide how to play the game of marriage versus independence. Determined to rule as much more than a figurehead, Mary asserts her claim to the English throne, threatening Elizabeth’s sovereignty. Betrayal, rebellion, and conspiracies within court imperil both thrones––and change the course of history. 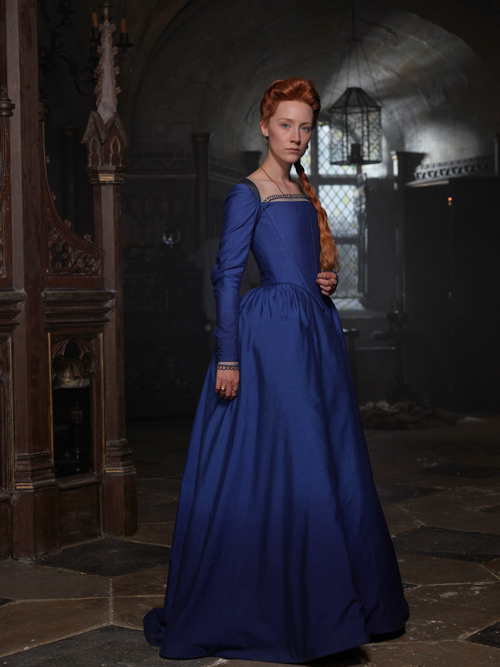 The filmmaking team for Mary Queen of Scots includes Academy Award winners costume designer Alexandra Byrne, make-up and hair designer Jenny Shircore and editor Chris Dickens, Emmy Award winning production designer James Merifield and BAFTA award winning director of photography John Mathieson. The producers are Working Title co-chairs Tim Bevan and Eric Fellner, and Debra Hayward, all Academy Award nominees as producers of Best Picture Oscar nominee Les Misérables . Bevan and Fellner have been co-chairs of Working Title Films, one of the world’s leading film production companies, since 1992. Working Title has made more than 100 films that have grossed over $6 billion worldwide, including over $1 billion at the U.K. box office. Its films have won 12 Academy Awards (for Tom Hooper’s Les Misérables and The Danish Girl; James Marsh’s The Theory of Everything; Tim Robbins’ Dead Man Walking; Joel and Ethan Coen’s Fargo; Shekhar Kapur’s Elizabeth and Elizabeth: The Golden Age; and Joe Wright’s Atonement and Anna Karenina), 39 British Academy of Film and Television Arts (BAFTA) Awards, and prizes at the Cannes and Berlin International Film Festivals. Bevan and Fellner were honored with the 2013 Producers Guild of America’s David O. Selznick Achievement Award in Theatrical Motion Pictures, the PGA’s highest honor for motion picture producers. Find out what went into crafting the story of Victoria & Abdul from author Shrabani Basu.